I stopped by the Montgomery Menard’s (I boycott anti-union Home Depot for their CEO’s effort to kill the Employee Free Choice Act) to pick up some drill bits last week and saw a picket in front of a Buona Beef that was going up in front of the Menard’s. picket line, I found several Fox Valley labor leaders and friends holding signs in front of about 10 inflatable rats. When I asked what was going on, my friends informed me that the owner of Buona Beef was out for an inspection and they were sending a message. A friend with Laborers Local 149 and I talked about the event and the “rat picket strategy” and decided that members of labor are going to have to start working more closely with political activists and other community leaders if we want to be more successful in these efforts. You can follow Laborers Local 149 events on their Facebook page. to invite friends and labor leaders to join a discussion along these very lines. 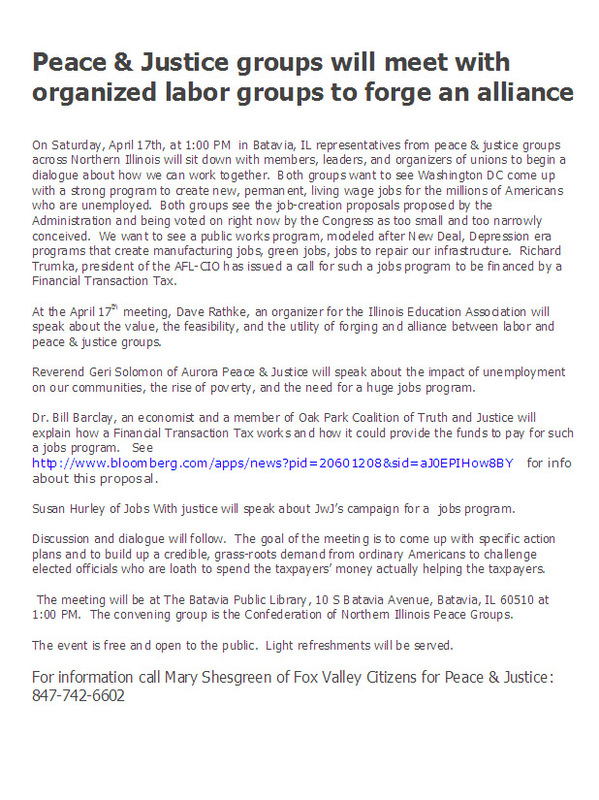 The Fox Valley Peace and Justice group is holding a forum on the topic – the event is free and open to the public. Don’t hesitate to join us on Saturday, April 17th at 1:00 p.m. at the Batavia Public Library (10 S Batavia Avenue, Batavia, IL). Details found in the flyer at right. This entry was posted on Wednesday, April 7th, 2010 at 7:19 pm	and is filed under The Front Page. You can follow any responses to this entry through the RSS 2.0 feed. You can skip to the end and leave a response. Pinging is currently not allowed. I agree, John, that union members do have to work closer with political activists and community leaders. I also think more members will have to be willing to get more involved politically by running for local seats. 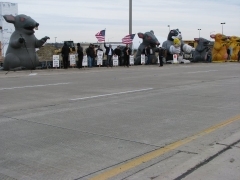 I was also at the rally in Montgomery, covering it for the Fox Valley Labor News (April 1, 2010 issue), and while the strong union presence garnered a lot of attention for its cause that day, a much more lasting action is needed. Achieving it politically — like the Fox Valley Building & Construction Trades Council did recently when it convinced the City of Aurora to adopt a Responsible Bidder Ordinance — is likely the most expedient course to pursue. TRUE – TRUE – TRUE!!! I think there are still many issues for labor yet to come. Considering the work situation within the industry, many apprenticeship programs are slimming down to “next to nothin'” programs. As I understand, prevailing wage agreements are based on the largest apprentice program in an area – that has always been the union programs in our area. With the turn-down in work, and the down sizing in local union apprentice programs, that means the ABC apprentice programs may become the largest in the area. That could mean disaster for the prevailing wage program!